The Condor Series of Rockets came from the need to carry larger paylaods than could fit on the griffin series. 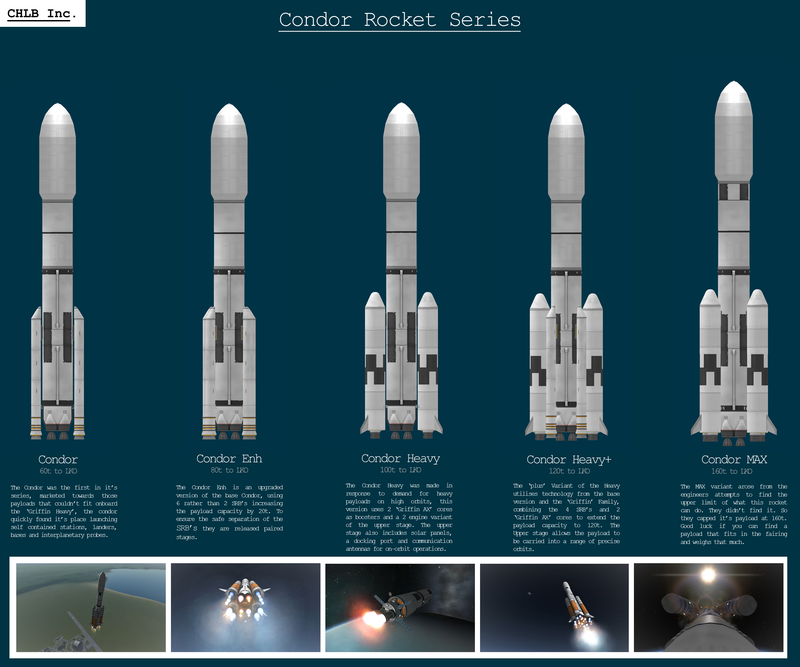 The Condor currently comes in 5 variants, the Base model using 2 SRB’s, the Enhanced using 6 SRB’s, the Heavy using 2 Griffin AX Boosters and a 2 engine upper stage, the Heavy+ using 2 Griffin AX Boosters as well as 4 SRB’s. The last variant is the MAX, using 4 extended Griffin AX Cores and an extended upper stage tank to lift 160t of Paylaod. A stock rocket called Condor Enh. Built with 136 of the finest parts, its root part is fairingSize3.